Joshua: Courageous Discipleship. JesusWalk Bible Study Series. Ralph F. Wilson, 'Joshua' (2016), after Tissot, 'Othniel', transparent watercolor on paper, 14x18 in. The Book of Joshua isn't politically correct. Instead of universal tolerance, it sees God offering the Promised Land to a particular people, the Israelites, and commanding them to displace its sinful residents by force. Yahweh is portrayed as a Mighty Warrior who gives victory to Israel, as well as the King who demands our complete submission and obedience. The book also introduces us to men and women of faith, who find strength in the Lord to step up to their place in history. 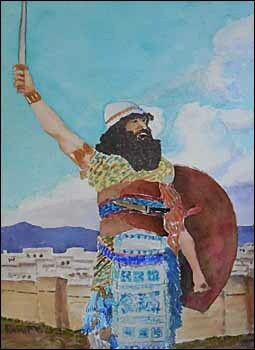 There's Rahab the prostitute, Caleb the old warrior, Othniel who conquers a city to win a bride, Acsah his wife who petitions her father for the deep wells their desert city will need, and Joshua himself, who learns that obedience God's bizarre battle plan to breach Jericho's walls brings about the city's fall with little need to fight. Lessons in book formats are available. Appendix 3. Whose Land Is the Promised Land? I encourage you to sign up for this study that will begin the Friday, September 16, 2016. Sign up now so you don't forget -- and invite your friends to do the same. This is our 43rd online Bible study since 1996. If you've participated in one before, you know how God can use them in your life. If not, then you have a treat in store for you. This is an cross-denominational study designed to help you grow as a disciple of Christ. This study, now completely rewritten, was first used online in 1998. -- Dr. Ralph F. Wilson. About the leader. Each Saturday I'll e-mail you the lesson for the week. Then you'll read the Bible passage and use my notes to help you understand it better. The weekly lesson includes all the discussion questions for the week. If you plan to use this study as the basis of a class or small group, feel free to download the free participant handout guides.